Well, today is writing day here at An Open Book, and I thought, for a change of pace, I'd introduce (or possibly re-introduce) you to a unique writing project I've been involved in (and am involved in! ), and the amazing woman in charge of it. And you can join us too! Introducing: Peculiar People Books (creating unique Christian fiction through group writing projects), and its founder, the lovely Amy Michelle Wiley! Joanne: Tell us a little bit about yourself, Amy. Amy: I am a lover of words and people, and God blessed me with a lot of creativity. I am a freelance writer and editor, and though I dabble in all genres, my favorite is fiction short stories. I especially like to take a true story (anything from Biblical fiction to "ripped from the headlines") and fictionalize it in a way that brings it alive and makes it real to the readers, the way Jesus often did with parables. I also use my passions to work in the Deaf Community as a sign language interpreter, getting to use words in two different languages. Other things I enjoy are spending time with my family, reading, singing, and crafts. I also am learning to live with the limitations of a chronic illness. Joanne: What motivated you to start Peculiar People Books? Amy: One of the marks of strong fiction is having a cast of characters who each have unique voices and personalities. It occured to me that one way to accomplish that would be to have a different writer focusing on each character. I've always loved doing things with other people, so the camraderie was definitely a big part of it as well. Joanne: Where do you come up with the ideas for the individual projects? Amy: Each of them has come out of ordinary things in my everyday life. I try to think of a topic that would lend itself well to being written with lots of characters and from lots of perspectives. For example, the first project which is yet to be published, Secrets of the Ice, was partially inspired by my own jury duty. I wondered what kind of "duties" citizens would get called on to do many generations from now when there might be colonies on various planets or space stations. Another one, Delivered, was inspired by the real-life postcard project that asks people to send in a secret about themselves. I came up with a Christian spin on it, and had the postcards ask for prayer requests. I'm open to getting ideas from other people, too, as happened with Struggle Creek, whose storyline was created by brainstorming with all the authors. And of course the joy of working with so many writers is that each person brings their own additions to the original idea. Joanne: What is the benefit to an author getting involved in these projects? Amy: There is something special and fun about being able to collaborate with other Christian writers to create something unique and different from what you could do alone. For new writers it's a chance to get published, and in doing so, get your name out to the world and be able to add to your publishing credits. For experienced writers, it's fun to expand your skills by trying something new. Joanne: Tell me about your newest project: Operation Orphan Plane. Amy: This one was inspired by another real-life event: the orphan trains. In the United States from 1854 through 1929, a few hundred thousand orphan children were sent by train from crowded eastern cities to farms and small towns further west. The hope was that the children would have a chance at a better life living with honest, hardworking families away from the crime of the big cities. I've read many historical fiction books about the orphan trains, so I didn't want just another book to join all the others, yet the idea of so many kids with so many stories seemed ideal for a PeP project. So, as seems to be my norm, I put a twist on it. I set the idea in the future, so the children are being sent to live on a space station. Since the characters will be in relatively close quarters for much of the book, I decided this one needed to be written consecutively. Rather than everyone sending in completed stories for the PeP team to consider, I'm asking writers to send in story ideas, so we can pick ones that go together and then begin writing the book in stages. I can't wait to see how it turns out, and to see what extra twists the authors bring to the storyline. This one is open for submissions until January 9th, so be sure to check it out if you're interested in being a contributor. Joanne: What is your vision for Peculiar People? Amy: I'd like the books to get successful and well-known enough to have sales bring in enough money for me to pay the contributing authors upfront for their stories. We're headed in the right direction--I've already made back what I put into Delivered--but are not quite there yet since I'll need to put that money into publishing the next book. I forsee PeP continuing to put out books every year or two, and I'm playing around with ways to make the flow and quality of the content improve with each book. This kind of collaboration is unique, and I hope we gain a lot of people who are as excited about reading our novel ideas as we are about writing them. As that happens, then we are also reaching out to people with the love and truth of God, as well as providing clean entertainment. Joanne: Anything you'd like to add? Amy: Please check out our website, www.peculiarpeoplebooks.com, to see the two books we have already published (they make great holiday gifts!) and to get information on submitting to our current work in progress. 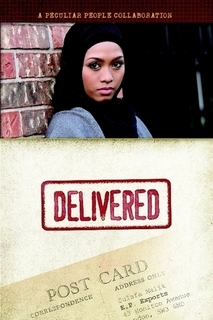 (I'm sure you can check with Joanne on how to buy an autographed copy of Delivered from her, as well.) Thanks for listening, readers, and thanks for the interview, Joanne. You've been such an important part of PeP. Joanne: Thank YOU, Amy, for sharing your passion, and this incredible project, with my readers! So, is your interest piqued? As she mentioned, story ideas are being accepted until January 9, 2011. Stop by the website for more information and how to submit! Thanks, my sweet friend! The added pics look great.